Jeff Potter said that flavours are like notes on a piano: some join together far more harmoniously than others. Think about: tomato and basil. Beef and horseradish. Peas and mint. Bacon and eggs. Apple and cinnamon. Strawberries and cream. Chocolate and coffee. Flavour combinations that are so ingrained in our consciousness that we don’t even question them – a veritable symphony of harmonious flavour chords. But have you ever stopped to ask yourself why they actually work? Michelin-starred chef and mad food scientist Heston Blumenthal came up with an explanation in the form of the “food pairing hypothesis” which suggests that foods that form pleasing flavour combinations (from obvious ones like strawberries and chocolate to more unexpected ones like caviar and white chocolate) do so because they share a greater number of chemical compounds responsible for flavour than less successful pairings. Scientific studies to test this hypothesis concluded that this does indeed hold true – but curiously only for Western European and North American foods and not for other cuisines, including East Asian. Based on an extension of this research Bernard Lahousse created Foodpairing, an interactive tool that allows you to seek out novel flavour pairings that work and presents them in a visually appealing graphic. For example, look at the strawberry Foodpairing graphic – the closer to the centre an ingredient is, the better the match. Clever. Of course, you need to be skilful to pull really inventive combinations off, even if the Foodpairing graphic suggests that they work – in the right hands, passion fruit and oysters can be sublime. In the wrong hands, it can be a culinary train-smash. For my money, I prefer to leave the mad scientist experiments to others and use the tried and tested combinations as my starting point – but with a twist. 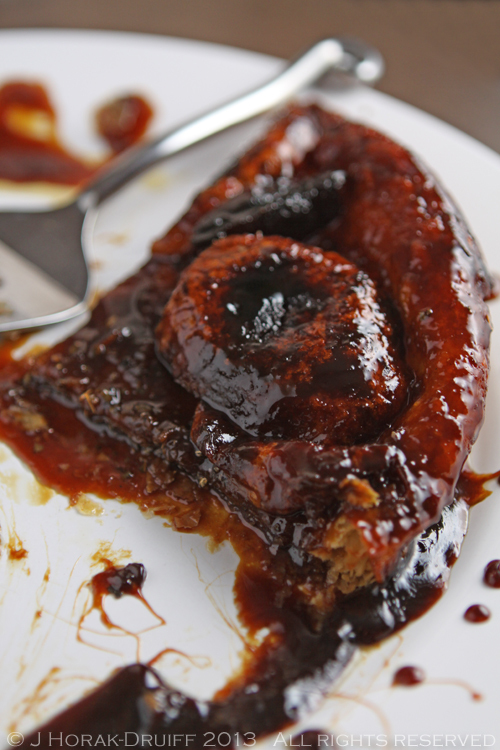 We’ve all had apple and sage in the form of a sausage, or a stuffing. But how many of us have considered it as a flavour combination for a dessert? I have a known affinity for using unusual spices in desserts – witness my pear and cardamom tarte tatin. So when I recently worked with McCormick to launch their 2013 Flavor Forecast and came across their apple and sage tarte tatin, I was instantly captivated. The sweetness of apples and caramel offset by the slightly bitter tang of sage, all on a crispy pillow of pastry. What’s not to like? I fiddled with the recipe a bit – I used heavily salted butter for the salted caramel effect; and didn’t have molasses, so I substituted soft brown sugar for the sugar component instead – but beware: this will give the caramel a colour so deep you’ll think it’s burnt, even though it wasn’t in the least. If you prefer a lighter look, use demerara sugar. The end result was nothing short of spectacular, even if I say so myself – flaky pastry, little lakes of burnished caramel, and islands of soft, caramelly apples – all saved from cloying sweetness by the subtle notes of sage. It’s a symphony of harmonious flavours – and guests are sure to ask for an encore. Apple and sage is a classic combination, but this recipe gives it a sweet twist by caramelising the apples in a French tarte tatin. Preheat oven to 200°C. Cut a circle of puff pastry just slightly larger than the circumference of your oven-proof skillet. Bring cider to the boil in 10-inch cast-iron skillet on medium-high heat, then reduce the heat to medium and cook for at least 10 minutes or until the liquid has reduced by half. Stir in the sugar and cook 5 minutes or until the caramel begins to brown. Then stir in butter and mix until it is melted and well blended. 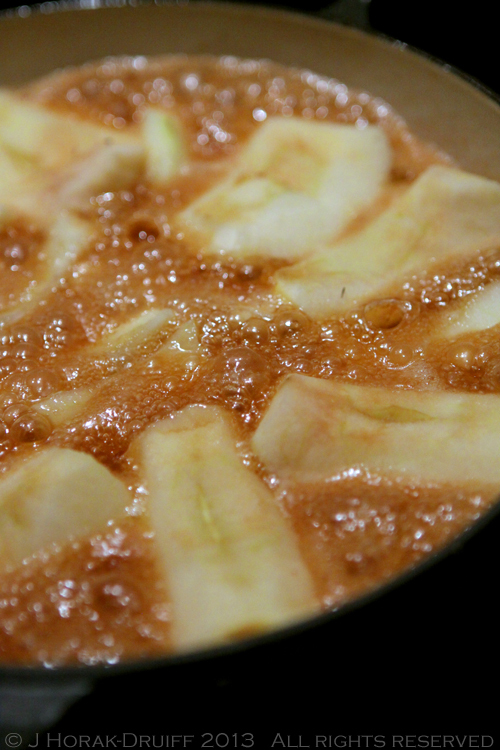 Carefully place the apples, cut sides up, into caramel, packing them tightly and being careful not to burn yourself. Allow to cook for about 5 minutes until the caramel has reached the desired colour. Remove from the heat and sprinkle with sage. Place the circle of puff pastry over apples, using a wooden spoon to carefully tuck the sides in. Bake for 20 to 25 minutes, or until the puff pastry is golden brown. Cool on wire rack 5 minutes. Place a plate larger than the circumference of the skillet upside down over the skillet. Using pot holders or oven gloves, hole both the plate and the skillet firmly and quickly flip over. Carefully lift the skillet - the tarte should easily drop onto the plate. Love that flavour pairing link. I’m with you about weird combinations – prefer the classics…and apple and sage is one of them. This looks So good. I agree with you – the classics are usually best – but I love turning them on their head by swapping a sweet for a savoury dish! 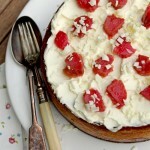 You should try my savoury caprese bread and butter pudding – utterly divine! WOW! This is what I call a WOW dessert! I actually pulled up your blog today to give the link to your sous vide recipes to a friend and that top photo stopped me in my tracks. Amazing! And now I have to try this. I love discovering unexpected pairings – we were once served a cheese course in Michelin-starred La Mare aux Oiseaux (of cute chef fame) and it was a mascarpone and blue cheese cream sandwiched in between ultra thin layers of white chocolate topped with a bit of truffle dust. I tasted a bit of the cream and found it odd and unappealing – bland with a slight bitter after taste. But put a mouthfull of the whole in your mouth and wow! Utterly amazing! Anyway, gorgeous gorgeous tarte tatin, Jeanne! Extremely tempting! That flavor combination is quite British and really original. Yet, oddly, I still find myself with reservations. I would certainly be unflinching at the idea of apples and sage in a savoury dish. Why am I flinching at the idea of apples and sage in a sweet one? Although, I have made apple rosemary pie (delicious) and had a NYTimes apple thyme pie recipe on a bookmarked list for ages. Okay. you’ve convinced me. Clearly, I’ll have to add sage and apples in a sweet pie to the bookmark list. Love the internal debate 😉 I love combining traditionally “savoury” herbs with sweet stuff – I did a peach & cardamom clafoutis a few years ago that ROCKED! Peach and cardamom sounds like an excellent combination. But isn’t it funny how impressions differ? I consider cardamom to be strictly a sweet spice (even though it’s a must add in an Indian curry – ha – I guess I should strike the “strictly”, shouldn’t I?) I know what you mean about combining savoury things with sweet stuff. Not long ago, we were reminded that ground black pepper is fantastic in ginger cookies. And of course, fresh strawberries, lemon juice and plenty of freshly ground pepper are the only way to eat fresh strawberries (unless you substitute Balsamic vinegar for the lemon juice). Now yo usee, I have always considered cardamom a stroctly “savoury” spice because I only ever used it in curries – but my eyes have been fully opened to the sweet possibilities now 😉 And yes! Love fresh strawberries with good, sticky balsamic vinegar & black pepper! Dark, caramelly apples, a hint of sage that teases the tongue, making you think…. what is in this? Beautifullly imagined and creative Jeanne! The science and the senses, now there is a perfect pairing for the cook! Oh Krista – do try it! You and Bear would love it, and it really isn’t hard to make. I have some apple and sage jelly from Jersey that I am slowly working my way through – so divine with smoked gammon! Holy deliciousness! Look at that gooey tart! Stellar work! I gotta say – it was pretty awesome to eat! Served it up to a restaurant owner, so I was pretty nervous but she loved it. Hurrah! Mmmm, I have also used rosemary with apple in a cake and it worked beautifully, so apple and sage sounds good too. How much fresh sage do you think it would need? Maybe a little less, as the flavour is pretty strong when fresh? Rosemary and apple cake – now there’s an idea…! And yes – I would be a bit wary with fresh sage – I once made inedibly bitter scones because I put in too much fresh sage… Maybe chop it microscopically finely and add half the quantity? last year one of my favorite books was the Flavor Thesaurus by Nikki Segnit and it is a bible. I’ve been enjoying discovering interesting pairings. I adore sage and apple together (in my beet soup) so this is a great dessert! I often think of sage as a savory herb but paired with apples it’s a real classic. Isn’t it just? And I love that it moves seamlessly from a savoury to a sweet combo!